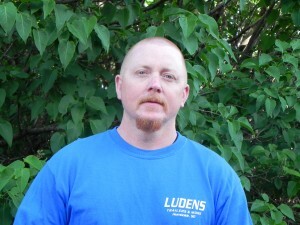 Dave has been with Ludens since 2012. He was a mechanic in the U.S. Marine Corps from ’87-’98, a drywaller/taper from ’98-’07, and a press operator from ’07-’12. He and his wife Lynn have one daughter, Breanna. Dave enjoys hunting, woodworking, and riding his motorcycle. He has been a volunteer firefighter since ’99 and is also a member of Humboldt American Legion, Rolling Thunder S.D. Chapter 1, and Sioux Nation Leathernecks M.C..